A brilliant and charismatic dancer, Fred Herko was a central figure in New York’s downtown avant-garde in the early 1960s. He was a member of Andy Warhol’s eclectic group of creatives who hung out at Warhol’s studio, known as the Factory. He went on to star in seven of Warhol’s earliest cinematic experiments in 1963, including Jill and Freddy Dancing, Rollerskate/Dance Movie and Salome and Delilah. A musical prodigy, Freddy studied piano at the Julliard School of Music before switching to ballet at the age of twenty. In 1956 he won a scholarship to study at American Ballet Theatre School and within a few years he was dancing with New York’s most prestigious and established choreographers. He was a founding member of the Judson Dance Theater, presenting six of his own works in the group’s concerts between 1962 and 1964. He was also a co-founder of the New York Poets Theatre, which staged one-act plays by poets and provided a podium for dancers, musicians and filmmakers such as Brian De Palma and Andy Warhol. As his career and reputation flourished, his personal life was falling apart. Freddy started using drugs, speed in particular, to fuel his creativity. By 1964 he was strung out and homeless. On October 27th he went to an ex boyfriend’s apartment and proceeded to take a bath. Some accounts say he invited a group of people to watch a performance. According to those who were there, Mozart’s Coronation Mass was playing as Freddy emerged from the bathroom stark naked and began dancing around the loft. As the music climaxed, Freddy leapt through an open window, falling five flights to the street below. His untimely death at the age of 28 robbed New York’s underground scene of one of its most exuberant, colorful and versatile performers and rising stars. 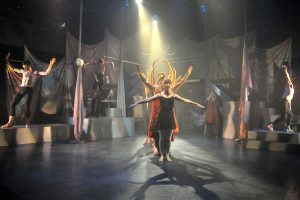 The play, FREDDY, presented by the Fountain Theatre and the Los Angeles City College, was written by Deborah Lawlor, based on her true story as a confidant and one time lover of the volatile dancer. In the play, Ms. Lawlor, here called “Shelley,” and portrayed by two actresses, Kate McConaughy as the “Past Shelley” and Susan Wilder as the present day version, recollects how back in the 60s, she was a naïve young woman who, like many others, fell under Freddy’s spell. 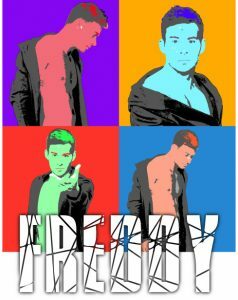 Freddy grabs you with a burst of energy and color that is reminiscent of the rock musical, “Hair.” Beautiful young dancers fill the stage, recreating the sensual, drug-fueled energy of Andy Warhol’s Factory. We soon meet Freddy (Marty Dew) and he is instantly the center of attention. Everybody wants to know him. Everybody wants to sleep with him. 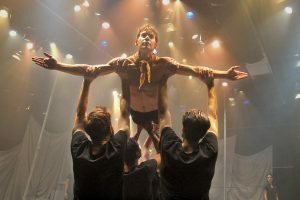 Directed by Frances Loy, with movement/dance direction by Cate Caplin, the play moves through the various chapters of Freddy’s life, cleverly blending theater, dance, music and multimedia to tell this story. We follow Freddy through his triumphs, his personal failures, and finally his sad demise. Marty Dew’s “Freddy” evokes charm and sympathy as he gives us a glimpse into this iconic character. A strong dancer and a powerful presence on stage, Dew pulls you in and make you care–but it is Susan Wilder as the “Present Day Shelley” who brings the most depth to her role. A seasoned pro, her past dance experience allows her to keep up with a young ensemble. Katie McConaughy as “Past Shelly,” Mel England as “Jimmy Waring,” Lamont Oakley as “Pete” and Jamal Hopes as “Johnny” are also to be commended. Other cast members; Alexandra Fiallos, Jamal Hopes, Tristen Kim, Jackie Mohr, Connor Clark Pascale, Justice Quinn, Savannah Rutledge, Brianna Saranchock, Trenton Tabak and Jesse Trout are all outstanding and they give it their all. Scenic Design by Tesshi Nakagawa is effective, as is Derek Jones’ lighting and Jillian Ross’ lighting design. Particularly impressive is a silhouette projection that shows Freddie’s pre-teen years as he interacts with his controlling parents. Something makes me think that Freddy and Elton probably would’ve gotten along. When: Performances of Freddy take place through Oct. 14. Where: The Caminito Theatre, located on the campus of Los Angeles City College at 855 N Vermont Ave. Los Angeles, CA 90029. Parking is FREE in Structure 4 on Heliotrope at Monroe (between Santa Monica and Melrose). 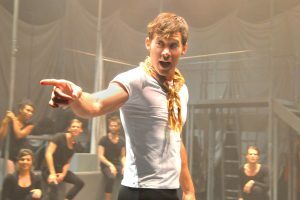 For more information, call (323) 663-1525 or go to www.FountainTheatre.com.